Angelena is using Smore newsletters to spread the word online. Deviance is an infraction of some agreed upon rule. 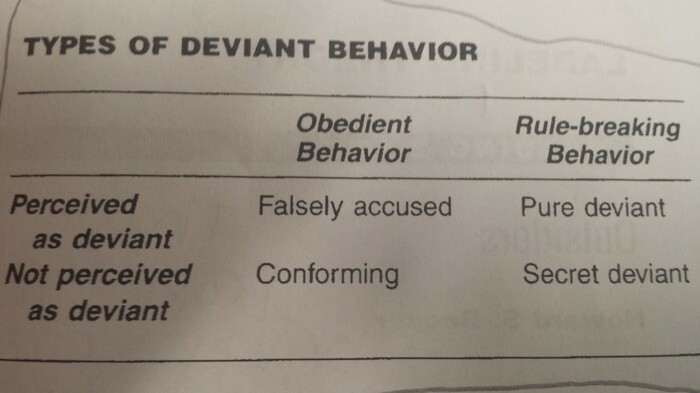 There are four types of deviance, conforming behavior which is obeying the rules in others perceive you as doing so, pure deviance which is disobeying the rules and are seen as doing so by others, falsely accused which is accused of breaking rules that they didn't commit, and secret deviance which is an improper act that is committed but no one sees it or doesn't see it as a violation. If someone is seen as a good student and they suddenly stop caring about their schoolwork and their grades show then they will be labeled as lazy or a dropout. Deviance is not the action that the person committes its the way society reacts to the action made by the person. Once you have committed a deviant act and you are labeled so by society then everybody expects for you to commit more deviant acts in the future. Therefore since society sees you as deviant then they will try to go through with this deviant labeling.